"Constantly finding more creative ways to convey a message is the role of any communication professional. We are always seeking unique ways of getting the consumer’s attention, wherever he or she is. Without sounding like a promotional activity, PR material can also have headlines that hit you. Achhe Din is an example of a headline that ultimately became a poll slogan." 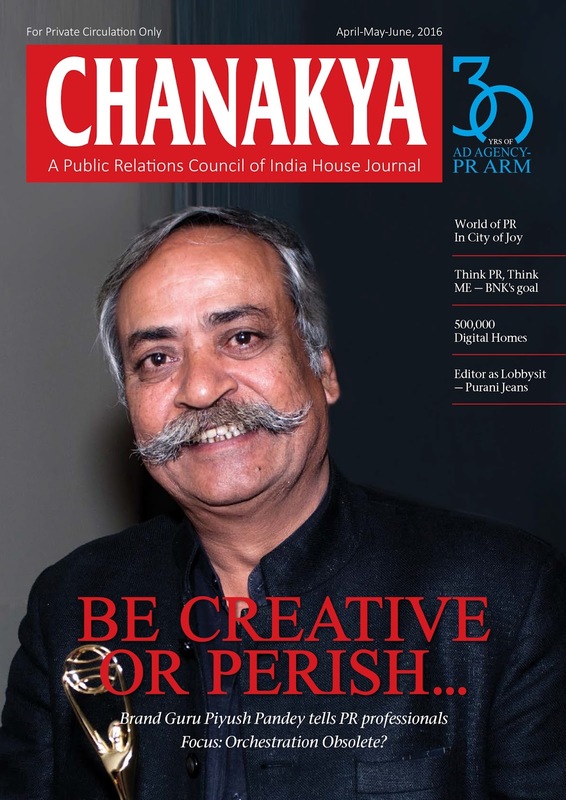 Presenting CHANAKYA April 2016 issue featuring Exclusive Interview with Ad Guru Piyush Pandey, 30 years to Ad Agency-PR Arm and Focus on Orchestration/Teamwork. Breezed through the interesting articles while flipping through the e-pages. Kudos to Mr. President & Chief Editor - BNK for a fabulous job in the design and relentless efforts at egging the sagging morale & pushing up the lethargic fingers to key in their thoughts on the designated topic to feature in this issue. I'm sure, seeing their articles featuring in this esteemed e-journal would be gratifying the authors and the ones, who couldn't wake up from the slumber or plain ignored the appeal, would rue their choices after browsing through the e-pages of this Chanakya edition. Trust, next time we would see more contributions and more pearls of wisdom & professional insights. Being an integral part of Chanakya for the longest time as its Editor, I feel good to view its newer & better avatar. May this go from strength to strength and be the most referred journal in the PR & Communication world globally. Together WE Can! This is an interesting initiative.Specially enjoyed the Piyush Pandey article on creativity in PR.Also the 20 for water.Keep up the good work.